Culinary professional and Eat Boutique creator Maggie Battista charts her weight-loss transformation in A New Way to Food. This candid hybrid memoir gathers mostly dairy-free vegetarian recipes to encourage ditching a diet mentality on the road to better health. This elegant guide advocates digging deep to figure out the source of your food struggles. Battista reflects on her childhood in an Italian and Honduran household, where body shaming was part of everyday encounters. Forgiving toward the people who made comments, Battista says that more important than decades of pain is the courage to turn from negative thinking. Detailing a revitalizing lifestyle change that advocates eating mindfully, the book imparts gentle self-care tips that focus on letting go of setbacks and taking a wholesome approach to food. There’s less motivational cheerleading than genuine, been-there-done-that compassion. Leaving room for differences, Battista says that there’s no single way a journey should unfold. Each recipe is preceded by an anecdote, and the collection is eclectic. Takeout Rice Pudding is followed by Mango-Lime Soda. Vegan Chocolate Chip Cookies appear in the same section as pasta and fried rice. Cookbook enthusiasts looking for distinct categories won’t find that here. The book groups recipes by seasons and memories to echo real life: sometimes fare is light, other times it is heartier, and often there’s an intriguing blend of tastes that range from “faux” pho in a jar, flavored with dried mushroom powder, to homespun bean dishes. 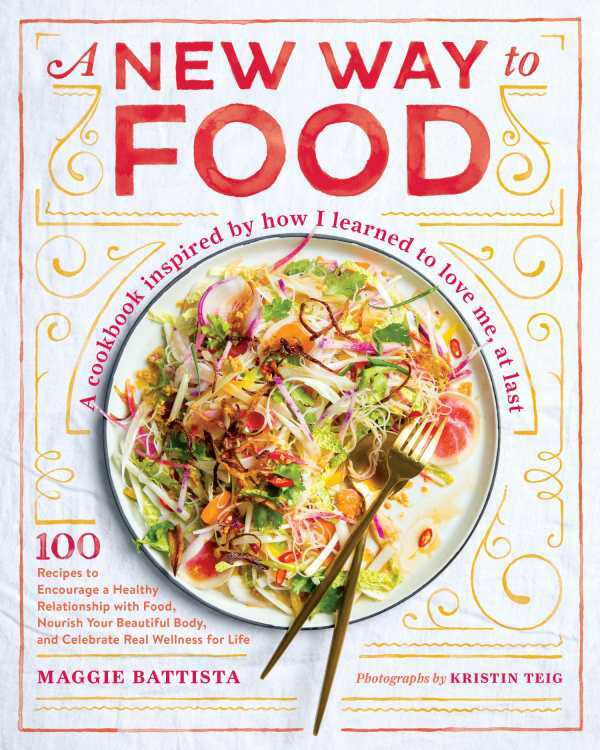 Featuring childhood and restaurant classics in lightened versions, as well as recipes that are linked to goals—one section compiles the dishes Battista is inclined toward when she’s in active wellness mode—the book suggests that it’s possible to simultaneously enjoy and pare back on indulgences. The point is less about specifics than about illustrating how food can map a person’s past and present. Battista does it with vitality and grace.